ඔහුගේ දරුවා අර්ධ සිංහලබෞද්ධ අර්ධ ඇංග්ලිකන්ක්‍රිස්තියානියෙකු වෙයි. ඔහුගේ දරුවා සම්පූර්ණ ඇංග්ලිකන්ක්‍රිස්තියානියෙකු වෙයි. ඇංග්ලිකන්ක්‍රිස්තියානි රාජ්‍යයක පදිංචි වීමට බලාපොරොත්තු වන අය මේ ගැනද සිතිය යුතුය. බිලි බෝයි "වගේ" උනොත් පුතේ -ලංකාවැයි රටක් ඇතේ.මොළෙන් වැඩේ දෙතොත් පුතේ-ඔසී ගියා වගේ පුතේ. මල් වට්ටිය ගනිං පුතේ-අස්ප ටෝක් දියං පුතේ.ක්‍රම සහ විදි දදා පුතේ-රට කන්නට ගනිං පුතේ. මේ බොරුකාරයන් පිලිබඳ සැබෑ තත්වය ඉහත පද පේළි දෙකින් මනාව පෙන්වා දී ඇත. 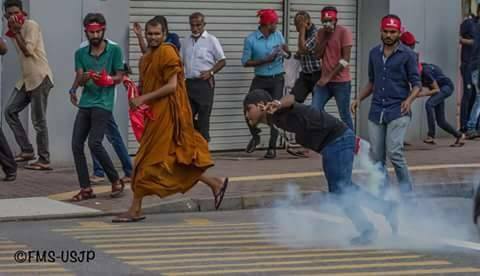 අපේ දරුවන් උන්ගේ වහලුන් පමණි. නමුත් වහලුන්ට ඒ බව තේරෙන්නේ නැව ගියාට පසුවය. ගුණරත්නම් ගේ ළමයි මොකටද මොනෑෂ් යන්නේ? ඇයි ඒ ලමයි පේරාදෙනි යයි කියලා හිතුවද ? The pathetic reality is the university students do not understand the reality of these people. Same has happened when I'm in the university. Today most of the people who lead others are abroad. Now they are not talking about so called socialism and stand against corruption. Only the idiots who followed them are still struggling.